(Phys.org)—Researchers from the U.S. 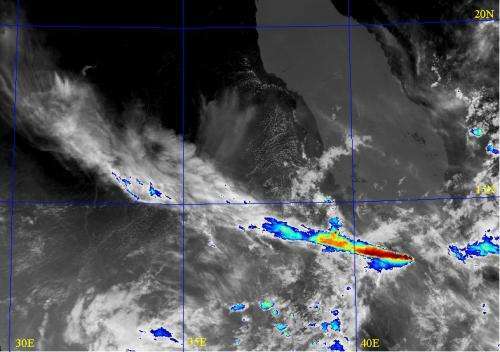 Naval Research Laboratory Ocean and Atmospheric Science and Technology Directorate report conclusive evidence that volcanic gases and aerosols from the explosive 2011 eruption of the East Africa Nabro Volcano breached the stratosphere, unassisted by the seasonal Asian monsoonal flow. On June 12, 2011, the Nabro Volcano explosively erupted, forcing sulfur dioxide (SO2) gas and volcanic aerosols high into the atmosphere. Prior analyses had suggested the Nabro plume reached the stratosphere only after being transported through a tropospheric meteorological phenomenon associated with the Asian Monsoon circulation. "There is overwhelming satellite evidence that the Nabro eruption caused a sizable and direct volcanic impact on the stratosphere," said Mike Fromm, NRL research meteorologist. "Robust satellite data indisputably indicate volcanic gases and particles penetrated the stratosphere during the initial eruption and a second eruption three days later." Thermal infrared (IR) imagery captured by the NASA Moderate Resolution Imaging Spectroradiometer (MODIS) satellite two hours after the eruption provides overwhelming evidence of a deep convective umbrella cloud with locally cold temperatures in a peripheral arc and warmer temperatures near the cloud center, a signature of violent convection associated with breaches in the lower stratosphere. To characterize the Nabro plume, NRL scientists use three instruments from NASA's 'A-Train' constellation—a series of quasi-simultaneous nadir and limb viewing measurement satellites that orbit Earth one behind the other. MODIS, onboard the satellite Aqua, acquires spectral data on global dynamics and processes occurring on land, in oceans, and in the atmosphere. The Ozone Monitoring Instrument (OMI), onboard the Aura satellite, distinguishes between aerosol types such as smoke, dust, and sulfates, and measures data to derive ozone. The Microwave Limb Sounder (MLS), also onboard Aura, provides measurements of atmospheric composition, temperature, humidity, and cloud ice. Data taken from the OMI shortly after the eruption indicate scattering volcanic aerosols such as liquid sulfate droplets and SO2. 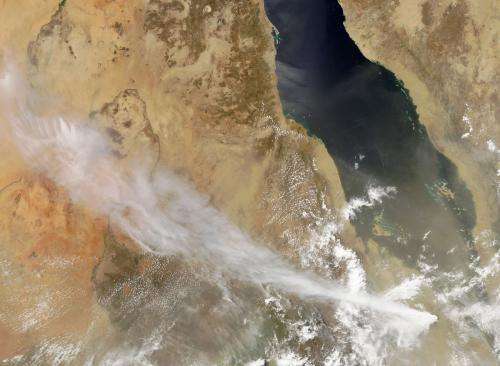 Observations from MODIS IR cloud-top temperatures revealed that an optically opaque volcanic cloud covers the same area as the OMI AI plume with a minimum IR brightness temperature of minus 78 degrees Celsius, a lower stratospheric value. "Ultraviolet backscatter sensors such as OMI are sensitive and cannot 'see through' optically thick clouds, indicating the signal of scattering aerosols and sulfur dioxide originated from altitudes above this high cloud top," says Fromm. "The opaque cloud surface also guarantees that no information from the troposphere below is obtainable." The day after the eruption, height-resolved SO2 data retrieved from the MLS also exhibited strong stratospheric SO2 enhancements to an altitude of nearly 63,000 feet, or approximately 19 kilometers. Hence, the SO2 profile data corroborate the high injection heights suggested by the combined OMI/MODIS imagery. Additionally, a back trajectory launched from a June 19 MLS SO2 observation shows that the stratospheric SO2 plume moves from the Mideast and Africa through mid-latitude Asia to the Pacific Ocean, never encountering the Asian Monsoon—a progression consistent with the region's recorded prevailing winds. These data convincingly show a classic Plinian characterization of the Nabro June 13 eruption defined by volcanic aerosols and other gases being injected into the stratosphere.